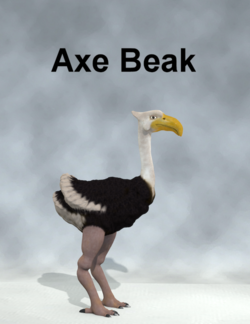 Similar to phororacoses, or terror birds, axe beaks are prehistoric carnivorous flightless birds. They are very fast runners and aggressively hunt during daylight. An axe beak resembles an ostrich in its lower portions, with a strong neck and a heavy, sharp beak. This page was last edited on 26 March 2019, at 20:17.